At Beauty Works you are offered peace and tranquillity, come in and relax to soothing music as our therapist provides the perfect treatment. From the moment you enter, you are taken to another world where your cares and worries disappear. 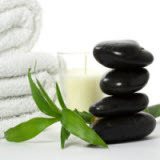 The salon creates an intimate and relaxing Holistic ambiance. For more about Beauty Works and the services we offer, select the service from the menu to find out more about us and the full list of services offered.